The squadron was established as a Naval Reserve squadron on 1 July 1970 as Helicopter Anti-Submarine Squadron Eighty Five (HS-85) "Golden Gaters." Operating out of NAS Alameda, CA it flew the Sikorsky SH-3A Sea King, later transitioning to the D and H models. In October 1994 the squadron was redesignated Helicopter Combat Support Squadron Eight Five (HC-85), it retained the nickname "Golden Gaters" and traded in its Anti-Submarine H model Sea Kings for utility model UH-3H Sea Kings. In February 2006 the squadron was again redesignated, this time to Helicopter Sea Combat Squadron Eight Five (HSC-85). It was equipped with the MH-60S Seahawk helicopter and it operated in a utility role. At that time the squadron changed its nickname from "Golden Gaters" to "High Rollers". On 8 July 2011 the squadron was retasked as a Special Operations support squadron in response to a request by United States Special Operations Command. It traded in its MH-60S Seahawks for HH-60H Combat Search and Rescue/NSW support variant helicopters and it adopted the name "Firehawks" from Helicopter Combat Support Special Squadron FIVE (HCS-5) which had been deactivated in 2006. HCS-5 which had been established as Helicopter Attack Squadron (Light) Five (HAL-5) on 1 March 1977 and redesignated HCS-5 in October 1989 also exclusively supported Special Operations prior to its deactivation. 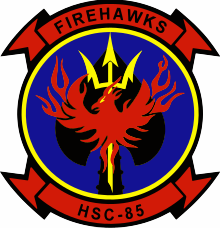 Although the nature of the lineage between HCS-5 and HSC-85 is only through the adoption of the "Firehawk" nickname by HSC-85, many former members of HCS-5 were either already serving at HSC-85, or came to serve at HSC-85 after the squadron was re-tasked with its current Special Operations (SO) mission. HSC-85 deployed supporting the SO mission in September 2013 and returned from the two-year deployment in late 2015. In accordance with a 2015 Navy directive, HSC-85 and HSC-84 were scheduled to be deactivated as a result of the Budget Control Act. However, primarily due to the efforts of Congressman Ryan Zinke, Congress directed the Navy to retain HSC-85. Yet, HSC-84 did go under and was later deactivated in March of 2016. HSC-85 is deployed worldwide in support of operational requirements as dictated by the Global Force Management Allocation Process and US Fleet Forces Command. ^ HSC-85 Takes on New Role Supporting Special Warfare Operations, by Mass Communication Specialist 3rd Class Dominique Pineiro, Navy Public Affairs Support Element West, U.S. Navy story number NNS110714, release date: 14 July 2011, retrieved 28 September 2016. Wikimedia Commons has media related to Helicopter Sea Combat Squadron 85 (United States Navy).